An adjustable kettlebell is a new piece of gym equipment that allows you to achieve a full body workout in under 20 minutes. The ability to add or remove weights ensures you always have the correct weight to suit your kettlebell workout. Whilst standard kettlebells are great for individual excercise sets, you often need a complete set which is expensive. Like adjustable dumbbells, adjustable kettlebells are cheaper and more convenient for home use. 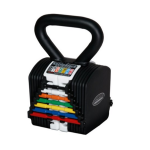 The Kettle Block by Power Block is a great choice for any serious kettlebell trainer. Available in two different weight ranges: 5-20 lbs and 8-40 lbs, these adjustable kettlebells are a great choice if you appreciate good design, ease of use and a high quality end product. What’s so great about the PowerBlock Kettle Block is the ease of use. For starters theres the handy weight chart (located beneath the handle). This makes it easy to identify the desired weight setting which can be adjusted with the easy to use selector pin. As you make adjustments, unused weights remain locked within the outer shell. This means the shape of the kettleblock remains consistent across all weight ranges, ensuring minimal adjustments to your technique. Another standout feature is the build quality. The KettleBlock is strong and durable, thanks to the hard metal and protective plastic outer coating. On review, my KettleBlock was knocked and dropped and maintained its ”out of the box” appearance. But, even more impressive is the guarantee of a smooth workout. Theres absolutely no rattling or handle vibrations caused by lose weights. With two different models to choose from the Kettle Blocks are a great choice for beginners and more advanced users. 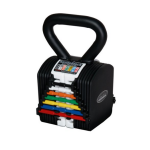 The 5-20 Kettle Block increases in increments of 3 and 4 pounds and replaces 5 standard kettlebells. The 8-40 Kettle Block covers a much larger weight ranges with weights increasing in increments of 4 and 5 pounds. As for the handle, it’s bobble free and comfortable. Its also designed for one or two handed workouts. One thing to note is the price, which is towards the upper end of the market. So be advised that there are cheaper alternatives. You may also note that at 13 x 11 x 10 inches (5-20 pound Kettle Block) and 16 x 11 x 11 inches (8-40 pound Kettle Block) both are pretty bulky. Combine this with their squarish shape you may catch your forearms against the outer edge of the kettlebell. The 16 to 36 pound weight range of the Stamina Adjustable Kettlebell make it a great choice for intermediate to advanced users. With weight adjustments of 4 increments you have 6 different weight settings to play with: 16, 20, 24, 28, 32, and 36 pounds. What I like about the Stamina Adjustable Kettlebell is the shape – its based on a traditional kettlebell design. This ensures a smooth flow and reduces the chance of wrist/forearm injury as you whip and swing the bell. Because of the shape, the Stamina Versa-Bell comes with a nice flat bottom. This makes it much easier to complete floor based routines, such as the Renegade Row. 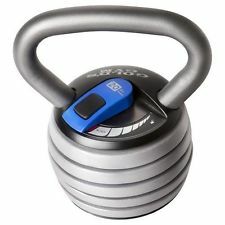 As for adjusting the kettlebell weights, thats nice and simple thanks to the easy to use locking pin. You simply secure the locking pin into one of the six weight settings (located on the side of the Stamina Adjustable Kettlebell). Unless you’re working out at the maximum weight setting, un-used weights remain in the square base pad holder. Next up, the handle. 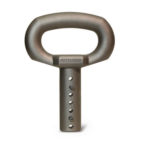 It’s made from cast iron, has a textured finish and is wide enough for two handed workouts. On review, I found the handle was comfortable and had good grip thanks to the finish. 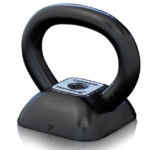 In terms of price, the Stamina Kettlebell comes in a approximately $3.5 per pound. Comparatively speaking thats more slightly more than the norm. Let’s not forget you are getting six different weight settings, and a 90 day warranty. Whilst reviewing the Stamina Versa-Bell I did have a couple of criticisms. At 9 x 9 x 11 inches its somewhat bulky. Also there is some rattling of weights. This is a design related issue as there held into place by a locking pin. Designed to look and feel like a traditional kettlebell, the Stamina Adjustable Kettle Versa-Bell offers superb value for money and replaces 6 standard kettlebells. 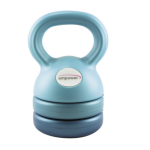 The Empower 3in1 Adjustable Kettlebell is specifically designed for women. Featuring a soft outer shell, ergonomically designed handle and a lighter weight range, this is currently the number one adjustable kettlebell on the market for women. The plastic outer shell is not as harsh on the hands or nails as other kettlebells on the market. This is down to the soft finish which makes working out with the Empower 3in1 smooth and comfortable. 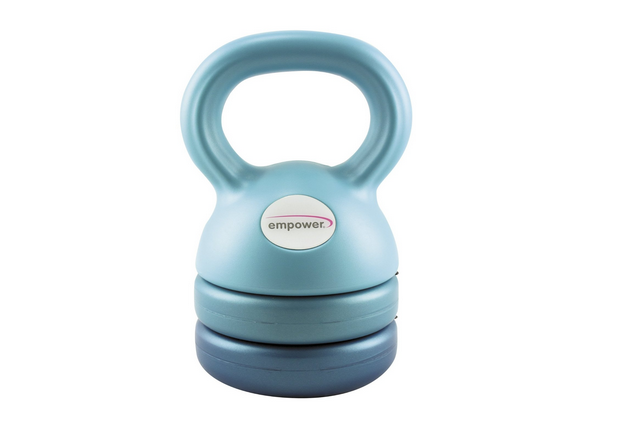 Unlike traditional kettlebells that feature a metal handle, the handle of the Empower Kettlebell is completely bobble free. Whats more the handle has been specially designed to fit a woman’s hand. The end result is a comfortable handle that does not result in cuts or hard skin. As for the weight range, the Empower 3in1 has three different settings: 5, 8 and 12 pounds that increase in 3 pound increments. Whilst other adjustable kettlebells do go as low as five pounds, they tend to go up in much larger increments. This can be frustrating for people looking for a lighter product as larger increments can result in a weight setting that’s too high. Also, why pay for heavier weights if they are not being used? Empower have stripped away the higher end of the scale resulting in a product that appeals to women, but is most importantly very well priced. Adjusting the weights couldn’t be easier thanks to the click and twist mechanism. To change a weight you simply push down on one of the buttons (located on the side of each individual weight) and twist the handle. It’s that simple. Another great benefit of choosing the Empower 3in1 kettlebell is the free ‘Swing Yourself Fit Total Body Workout DVD’ you’ll get. Featuring Gin Miller this is a great added bonus and will help you get started with your kettlebell workouts. In terms of negatives these are only likely to be a problem if you are a more advanced kettlebell trainer. If that’s the case you may fine that the weight range 5 – 12 pounds is very limiting. Whilst it’s possible to tone muscles you might struggle building strength as you progress. Also you’ll need to alter your technique slightly as all of the weights are detachable. Purposefully designed to fit a women’s hand, the Empower 3-in1 comes with features to protect the hands and nails. If you’re looking for a compact adjustable kettlebell then the Rocketlock kettlebell could be the one for you. Available in two different weight ranges, the Rocketlock Adjustable Kettlebells are the closet you’ll get to a traditional kettlebell design. What’s great about the shape is that it ensures the balance and centre of gravity remain consistent during your workout. This means that you get maximum benefit from your kettlebell routines, helping to achieve your goals quicker. A great choice for beginners and more advanced users, the kettlebells are available in two different weight ranges: 14 – 20 and 24 – 36 pounds. Beginners: The Rocketlok 14-20 Adjustable Kettlebell offers three different weight settings: 14, 17 or 20 pounds. The base weight of the kettlebell is 14 pounds which you can adjust via two 3-pound weighted cylinders. Intermediate/Advanced: The heavier Rocketlok 24-36 Adjustable Kettlebell offers a little more flexibility with four different settings: 24, 28, 32 and 36 pounds.The base weight of the kettlebell is 24 pounds which you can adjust via three 4-pound weighted cylinders. To adjust the weights you first need to remove a specially made plastic locking cap. Once done you add or remove solid steel weighted cylinders. With the weights securely locked into position you’d be forgiven for thinking the Rocketlock Kettlebells were in fact standard non-adjustable kettlebells. Considering the body and handles are made from solid solid cast steel both kettlebells offer good individual value for money. 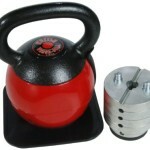 However, other adjustable kettlebells are available covering the entire weight range for a much cheaper combined cost. 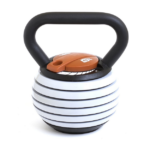 The build quality is another standout feature – the handle is smooth and there is no rattling or movement of weights whilst operating the kettlebells. Aside from the combined cost, the only slight criticism of the Rocketlock Kettlebells is concerning the circumference of the handle. Compared to others I have tested the handle is pretty wide and would be problematic for anyone with smaller hands. Also being based on a traditional kettlebell there is less free room when working out with two hands. One final thing to note is that when working out at a mid range setting, there is no storage unit for the unused cylinders. So be sure you do not misplace them. If traditional kettlebell size and shape is important to you then nothing else compares to the Rocketlok Adjustable Kettlebells. Probably one of the best adjustable kettlebells on the market is the Quick-Lock Kettlebell (QLKB) by Ironmaster. Available as a standalone handle or combo set (handle plus weight plates), this adjustable kettlebell is easy to use, hard wearing and completely rattle free. 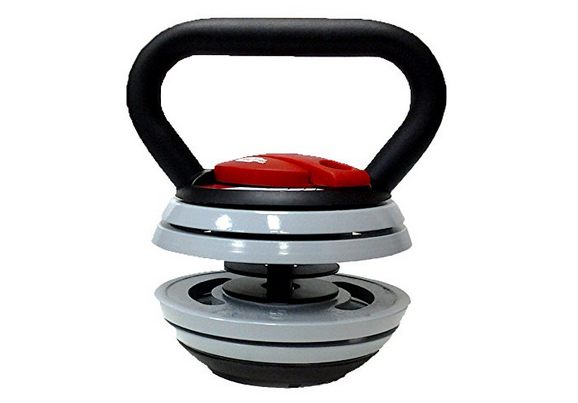 Made from solid steel, the Quick-Lock handle weighs 22.5 pounds and is compatible with Quick-Lock Dumbbell weight plates. What’s cool about the handle is the shape/size. The curved edges limit the free space when working out with one hand, but come in useful for two handed workouts. The finish is completely smooth and the size of the handle (8.75 wide x 7.75 tall – inches) minimises the risk of accidental injury. As I mentioned, the Ironmaster Quick-Lock Kettlebell is also available as a combo. If you chose this option you’ll get the Quick-Lock handle, weight plates and locking screw. The combo provides a weight range from 22.5 pounds up to 57.5 pounds (2.5 pound and 5 pound increments). You can also purchase an add on kit that allows you to adjust the kettlebell weight all the way up to 80 pounds. The 80 pound add on is a single 22.5 weight plate. As you’d expect all components are interchangeable with other Ironmaster products. When it comes to adding or removing the weight plates, you simply twist the locking screw that’s neatly tucked away on the underside of the kettlebell. It’s incredibly easy to master. After a bit of practice, I managed to switch a weight plate in under 5 seconds! The locking screw is compatible with other Ironmaster products and comes with thick locking threads. This securely holds the weight plates in position meaning you need not worry about the threads wearing down over time. Some of the additional benefits of the Ironmaster Quick-Lock Kettlebell include it’s shape, which is designed to look and feel like a traditional kettlebell. It also has a flat bottom meaning you can use it for floor based kettlebell workouts. Finally, it’s extremely hard wearing and will definitely survive being dropped from height. At least mine did! If you’re looking for an adjustable kettlebell with a huge weight range, look no further than the MIR Pro Kettlebell. Adjustable in 11 pound increments, you can adjust the kettlebell weight from 10 pounds up to a huge 83 pounds. 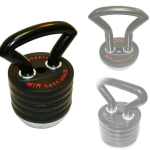 The MIR Adjustable Kettlebell gives you the biggest weight range on the market, replacing up to 5 kettlebells. At just $1.80 per pound, you’ll be hard pushed to find many cheaper adjustable kettlebells. Made from cast iron the design of the MIR Pro Kettlebell is truly unique. The large handle is used to house the weights which are held in place via locks located at the top and bottom of the handle. These locking pins do their job well, securely holding the weights in place whilst in motion. This eliminates the chance of rattling. As for size, the handle has been designed to allow both one and two handed routines for maximum flexibility. 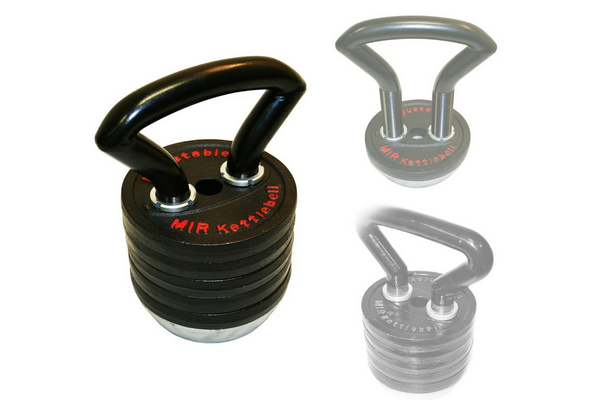 You should note that the MIR Pro Adjustable Kettlebell is taller than others on the market. This can make it difficult to complete certain routines, for example the kettlebell clean. In terms of handle smoothness, you may find you need to smooth out the odd bobble but generally speaking it’s not bad. One of the negatives about the MIR Pro Adjustable Kettlebell is the method of adjusting the weights. It’s annoyingly fiddly and takes much longer than any of the other adjustable kettlebells I have tested. This becomes especially frustrating when you’re tiring after a long workout. It should also be noted that the MIR Pro Adjustable Kettlebell is somewhat bulky and that the fine threads used to hold the weights in place are susceptible to wearing over time. One final point to mention is the weight plates which are all weighted and sized the same. As mentioned the increments are all set at 11 pounds which can be limiting. For example, some routines require a much smaller weight increments. Taking it’s shape and design from a traditional kettlebell, the CFF Adjustable Kettlebell comes with an impressive weight range. At 10 – 40 pounds this adjustable kettlebell replaces seven individual kettlebells. Thanks to the lock and twist mechanism located on the top of the kettlebell, you can quickly add or remove the weight plates. With each of the 6 weight plates weighing 5 pounds, you can workout at any of the following weight settings: 10, 15, 20, 25, 30, 35 and 40 pounds. If you haven’t heard of CFF then rest assured these guys know the market well. Their competition kettlebells are one of the best competition kettlebell sets you can buy. Recognising the need for a more flexible product, the CFF Adjustable Russian Kettlebell is a great choice if you’re looking for an adjustable kettlebell shaped like a traditional bell. Personally I am not a big fan of this style of adjustable kettlebell. The weight plates tend to rattle and clank whilst the kettlebells in motion, which I find annoying. That being said, you do get a lot of weight for your money with the CFF Adjustable Kettlebell. If you’re looking for an adjustable kettlebell with a large weight range and balanced like a traditional kettlebell, this may be the one for you. As far as adjusting the weights go, you first twist the locking mechanism to the unlock position. You can then start adding individual weight plates. To lock, you twist the tab back to the lock position. Whilst this is easy to do, I found it more fiddly since you need to manually add the weights. Both the weight plates and handle are made from solid steel. The base is covered with a protective rubber base which does a great job of protecting wooden floors from scratches. In terms of size, the handle is larger than most which is great if you enjoy two handed workouts. If you do purchase the CFF Adjustable Kettlebell, my recommendation when adding weights is to start from the top. If you go bottom up, you’ll bash your forearm/wrist on the weight plates when you swing it overhead. If you’re looking for even more flexibility from an adjustable kettlebell weight, then you should consider the CrossBell Kettlebell. This kettlebell provides more flexibility in terms of weight adjustments than any other kettlebell on the market. Thanks to the fill hole, you can adjust the weight of the kettlebell using a number of different materials, including: water, sand, stone – the list goes on. 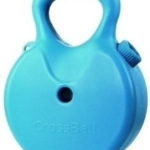 One of the major benefits is that most materials are free, meaning the CrossBell Kettlebell is one of the cheapest adjustable kettlebells on the market. What’s more, when you empty the CrossBell Kettlebell it only weighs 2.2 pounds so it’s extremely portable. 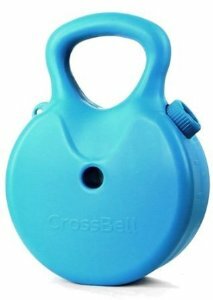 Made from hard plastic and available in blue and natural, the CrossBell is pretty much indestructible. So no need to worry about accidental damage. It’s also extremely versatile since it can be used for dumbbell and barbell training. You can even use the CrossBell for resistance training as it comes with a clip, for use with a cable pull (see top left corner in image). Note: If you’re interested in using the CrossBell for barbell training all you need is the CrossBell Kettlebell Bar. In my opinion this kettlebell will suit a beginner or someone on a budget who’s less concerned about technique. 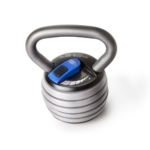 At 14 x 10 x 4.25 inches the CrossBell Kettlebell is one of the bulkier adjustable kettlebells so it will impact technique on certain routines. The handle also gets slippery as you sweat making it somewhat troublesome to handle. Finally, if you do not fill the CrossBell up completely the material will move about. This is not ideal for traditional kettlebell training as it affects the balance. That being said, it’s versatility is great and you can adjust the weight in whatever increments you choose. Another adjustable kettlebell that’s compatible with standard weight plates is the Fitness Gear Adjustable Kettlebell. With space for up to 4 weight plates, you can adjust the weight in increments of 2.5, 5 or 10 pounds. This means the Fitness Gear Adjustable kettlebell provides a weight range of 20 up to 50 pounds and replaces up to 11 standard kettlebells. 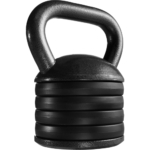 Made from solid cast iron the fitness gear adjustable kettlebell weighs 20 pounds out of the box. The handle weighs 15 pounds and the bottom weighs 5 pounds. Although there’s space for 4 additional weight plates, if you’re adding 10 pound plates there’s only room for 3. That’s because the 10 pound plates are much thicker than the 2.5 and 2.5 plates. As mentioned adding 3 additional 10 pound plates gives the Fitness Gear Adjustable Kettlebell a total weight of 50 pounds. To add and remove the weight plates you remove the bottom and add the plates to the body. The lock securely in place so there’s no need to worry about the plates or bottom coming lose. One thing to mention is that the fitness gear adjustable kettlebell is made to work with 1″ hole weight plates, not the 2″ Olympic plates. The handle is nice and big and accommodates two hands. What I like about the handle is the squarish finish which is more like a competition kettlebell handle. Because the Fitness Gear Adjustable kettlebell is powder coated it’s not as smooth finish as others but does protect the kettlebell from knocks. One final thing to mention is the size. At 8.27″ (length) x 6.3″ (width) x 10.08 (height) inches the size pretty standard. Whilst there are smaller adjustable kettlebells on the market they don’t offer the weight range on offer here. If you are planning on working at the 50 pound max weight be warned the kettlebell is much bulkier. The Kettlebud Adjustable Kettlebell handle is an awesome choice if you already workout using Olympic weight plates. Made from military grade aluminium, the Kettlebud handle easily adjusts from 5 to 100 pounds plus. Thanks to the hardened steel release pins, you can add up to four Olympic weight plates to the KettleBud handle, transforming it into a fully fledged adjustable kettlebell. Out of all the adjustable kettlebells on the market, the Kettlebud handle gives the most flexibility in terms of weight range. Olympic weight plates can be purchased in the following weights: 2.5, 5, 10, 25, 35 and 45 pounds. This means the maximum weight range of the KettleBud would be 185 pounds (4 x 45-pound weight plates, plus the 5 pound weight of the handle) which is unheard of. The gunmetal handle is extremely smooth and comes slightly textured to offer an improved grip. It also snugly supports a two handed kettlebell workout. Having tested the Kettlebud Adjustable Kettlebell, I would say that the handle differs from a standard kettlebell handle, it’s thicker and shaped slightly different, but you soon get used to it. One thing I would say about the Kettlebud is when you hold it in your hands, it feels like a premium product, it’s also extremely hard wearing which is a real bonus. As for adjusting the weights, you do this by: removing the release pins, adding one or more Olympic weight plates and finally replacing the pins. 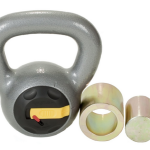 The manufacturers, Kettlebud Tactical Fitness have stress tested the Kettlebud at its maximum weight range so no need to worry about your weight plates coming lose. Overall I was really impressed with the Kettlebud Adjustable Kettlebell. Clearly you‘ll need to either already own or purchase some Olympic weight plates before you can use it. This can be quite expensive in contrast to some of the other adjustable kettlebells on the market, but would be a great choice if you use Olympic weights as part of other routines. The Titan Fitness Adjustable Kettlebell Weight is very similar in look and design to the CFF Adjustable Kettlebell Weight. The major difference between the two is the weight range. 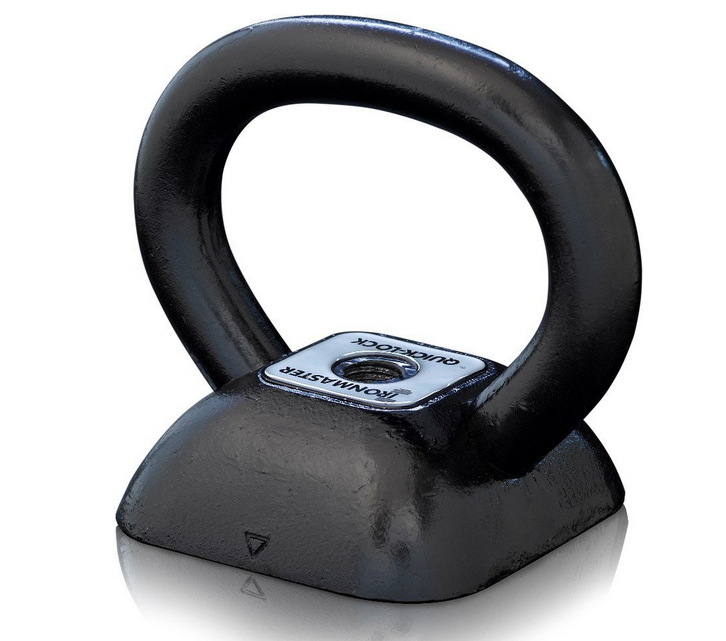 At 5 – 20 pounds, the Titan Fitness Adjustable Kettlebell is much lighter and therefore cheaper than the CFF. Ideally suited to beginners or women the weight range is more than enough to get you started. With six different weight plates all weighing 2.5 pounds the Titan Fitness Adjustable Kettlebell replaces 7 standard kettlebells. You can adjust the weight at the following increments: 5, 7.5, 10, 12.5, 15, 17.5 and 20 pounds. (Remember that the handle weighs 5 pounds and you do not necessarily need to add weight plates to work out). Adjusting the weight plates is very simple thanks to the quick lock mechanism located on the top of the kettlebell. The handle is nice and big and can definitely be used for two handed workouts. It’s made from cast iron and is power coated to leave a nice finish. In terms of handle smoothness, I did notice the odd bobble although this was not a major concern. What I really like about the Titan Fitness Adjustable Kettlebell is the price. 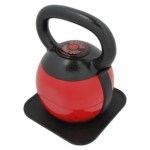 It’s one of the cheapest adjustable kettlebells on the market for the weight range on offer. 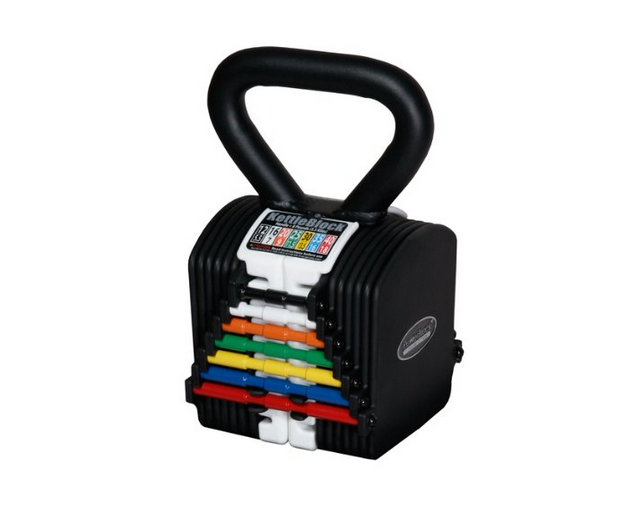 Comparing this to the seven standard kettlebells it replaces represents a massive saving. Final point to note is the shape. It’s designed to look and feel just like a standard kettlebell making it smooth and easy to manoeuvre. The bottom is also flat meaning you can use it for floor based routines. Ideally suited to beginners, this well priced adjustable kettlebell offers 7 different weight settings. Another adjustable kettlebell that uses detachable weight plates is the Gold’s Gym adjustable kettlebell. Although it’s almost identical in appearance to the Titan Fitness Adjustable Kettlebell, there are some differences. The weight range is 5 – 20 pounds but the increments are 3 pounds. That means that the Gold’s Gym Adjustable Kettlebell replaces 6 standard kettlebells. On it’s own the handle weighs 5 pounds and you can add weight plates to workout at the following weights: 5, 8, 11, 14, 17 and 20 pounds. The method of adjusting the weight plates is the same as other models that use detachable weight plates. You twist the locking lever (located on top of the kettlebell) to open and and secure the weight plates into position. When removing and replacing the weight plates you’ll need to be mindful that each has a designate location. 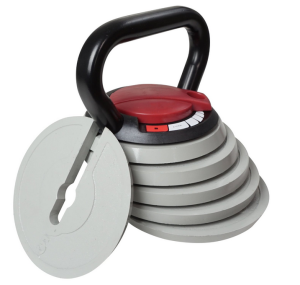 The mounts that hold the weights into position are sized differently to minimise rattling. If you’re new to kettlebll training you’ll be pleased to know that the Gold’s Gym Adjustable Kettlebell comes with a free dvd. This is a great way of getting you started. Talking of DVD’s this is the adjustable kettlebell used by Jillian Michaels in her Shred-It with weights program. In terms of price, this is one of the standout features of the Gold’s Gym Adjustable Kettlebell. Like the Titan Fitness Adjustable Kettlebell, it’s priced to sell and will appeal to beginners. The added bonus with the Gold’s Gym model is the free workout DVD. 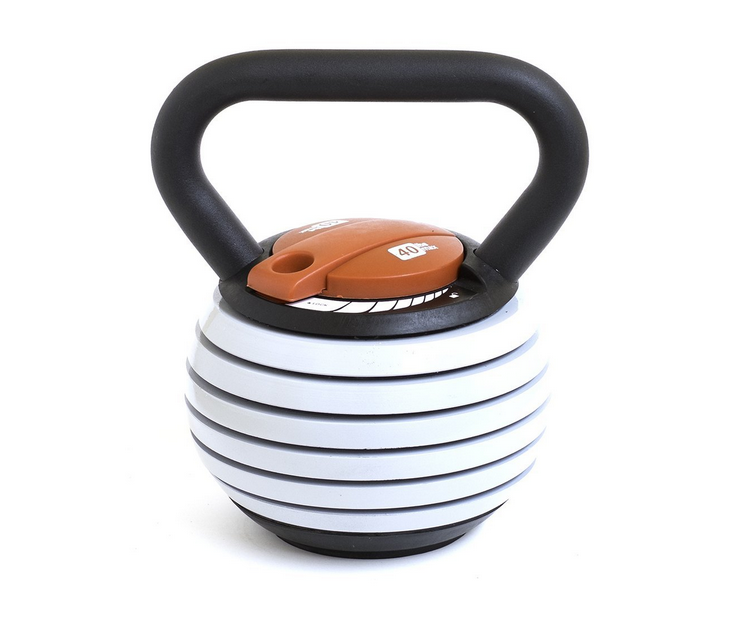 As for shape, it’s again designed to mimic a traditional kettlebell. It comes with a flat bottom and handle that’s large enough for two hands. 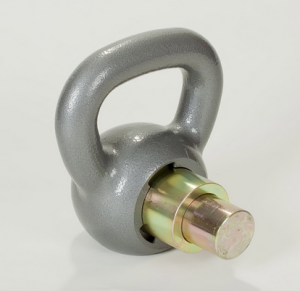 Out of the two models the handle on the Gold’s Gym Adjustable Kettlebell just edges it as it was bobble free. 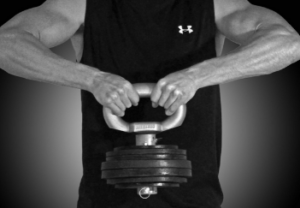 The 10 – 40 pound adjustable kettlebell by Kettlebell Kings is another model that works with weighted plates. 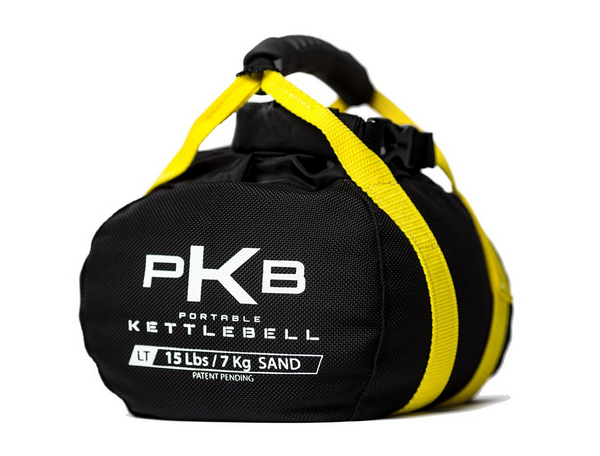 It’s available in two different colours: black/silver and (traditional Kettlebell Kings colors) black/yellow. This model is almost identical to the CFF Adjustable Kettlebell. Like the CFF, the Kettlebell Kings adjustable kettlebell has seven different weight settings. These increase in 5 pound increments. This means you can adjust the weight to 10, 15, 20, 25, 30, 35 or 40 pounds. Adjusting the weight setting is done by pulling out the locking mechanism and then turning it to unlock the weight plates. You then add the weight plates to the centre console before locking into place by returning the mechanism to the starting position. The locking mechanism is located on top of the kettlebell. As per my review of the CFF, I am personally not a big fan of this type of kettlebell. Having reviewed all of the models available, I dislike the rattling and method of adjusting weights. Whilst it’s easy enough, it can be fiddly. This can be frustrating when you’re tiring towards the end of a routine. However, this is just my opinion, there are lots of positive reviews from the wider market concerning the weighted plate models. What I do like about the Kettlebell Kings adjustable kettlebell is the shape. 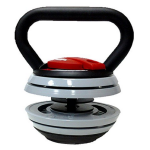 It’s based on a traditional kettlebell and has a good centre of gravity. The flat bottom also has a rubber coating and the handle is nice and big. As for price, the Kettlebell Kings model is cheaper but you sacrifice the free DVD you get with the CFF. All other aspects are virtually identical between the two. An adjustable kettlebell has a mechanism that allows you to control the kettlebell weight. You can adjust the weight with removable weight plates. Each weight plate weighs between 5 and 10 pounds. The handle of a kettlebell weighs approximately 5 pounds and represents the minimum the kettlebell can weigh. For example, you can still work out with just the kettlebell handle, even after removing all of the weight plates. The CFF Adjustable Russian Kettlebell will give you a good idea of what an adjustable kettlebell looks like without weight plates. Kettlebells are a great addition t0 any workout routine. They help to build and tone muscles, burn fat and improve cardiovascular fitness. Traditional workout routines focus on individual muscles, meaning you need to spend hours working out. Kettlebell workouts work the entire body, helping you reach your goals in under 20 minutes. No matter what your fitness level are or whether you’re training professionally or for fun, you can easily integrate kettlebell workouts into your routine. Adding a kettlebell to your training will help you reach your goals quicker. Improve your cardio fitness: You’ll combine cardio work and strength training within the same routine. No more spending an hour weight training and another hour on a boring running machine. Reduce body fat: Kettlebell workout routines are high intensity, meaning you burn through calories quicker than traditional excercise. Tone muscles: You’ll notice an immediate impact on the shape and definition of your muscles. Kettlebell training tones all muscles within the same routine. Increases strength: Lifting and swinging a kettlebell regularly will improve your core body strength. Improve balance: The way a kettlebell is designed encourages routines that work the whole body. Working areas such as your ankles, legs, back and core will improve your stability. Helps to reduce injury risk: Working muscles in isolation increases your injury risk, both during and after excercise. Standard kettlebells: Increase in size as the kettlebell weight gets bigger. The handles tend to be shaped like an arc – this allows the user to comfortably workout with two hands. If you’re looking for a normal kettlebell, checkout my best kettlebells buying guide. Competition kettlebells: Stay the same size even when the weight gets larger, this is to maintain a consistent feel as weight increases. Competition Kettlebells help people who do a lot of reps and also helps when going from one weight to another. The handles are squarish in shape and all the same size. Adjustable kettlebells: Enable you to add or remove weights to suit your routine. Adjustable kettlebells come in different designs, some use pins to secure the weight plates while others have a complete enclosure to hold the weight. Adjustable kettlebells are a great choice if you’re serious about kettlebell training. The ability to add or remove weights ensures you always have the correct weight setting for a routine. This enables you to add more and more kettlebell workouts to your routine, taking your training to the next level. If you’re working out from home with limited storage space, adjustable kettlebells take up much less space. Why purchase 7 individual kettlebells for $400+, when you can get them all in one for half the price? It’s more common to see fixed weight kettlebell sets within professional gyms. This is a matter of convenience, by saving people having to manually adjust weight settings. Other than this, the shape of a fixed weight kettlebell is more traditional and often less bulky. This can make swinging a fixed weight kettlebell smoother and more natural. Within the home environment, beginners often start with one or two fixed weight kettlebells. Individual weights are very cheap to buy and allow users to master a handful kettlebell routines. The downside is that they are very limiting as users become more advanced. Whether you’re new to kettlebell training or not, my advice would be to start off with an adjustable kettlebell. Standard kettlebells are good for beginners but as you progress with kettlebell exercise you will likely need to adjust the weight setting. Buying a standard kettlebell set is very expensive. Adjustable kettlebells offer you an affordable alternative to own a set of weights equivalent to bulky set of standard kettlebells. When I started kettlebell training I purchased Cap Barbell kettlebell which is still a great choice. I later found out that I needed to add more weight to improve my weight resistance. I decided to try out adjustable weights and purchased Stamina adjustable kettlebell. It is one of the best kettlebells, I have ever owned. Given the huge savings you make when purchasing an adjustable kettlebell it’s no wonder theres lots to choose from. I know of at least 20 different adjustable kettlebells you can buy from Amazon, and another 10 from other online stores. When choosing an adjustable kettlebell, there are a number of things you should consider. Kettlebell weights range from as low as 5 pounds (Rocketlok adjustable kettlebell), all the way up to 80 pounds (Mir Pro adjustable kettlebell). For this reason, manufactures tend to offer ranges applicable to the mass market. For example, a user training with an 80 pound weight is unlikely to benefit from a 5 pound weight setting. Common weight ranges are: 5 – 15, 10 – 40 or 16 – 36 but all manufacturers offer different options. One of the best selling models is the PowerBlock Kettle Block which has a weight range of 5-20 lbs. Weights come in increments of 4 i.e. 5, 8, 12, 16, 20 lb. Lookout for manufactures offering the same model in different weight ranges. Rocketlock offer the Rocketlok 14-20lb Kettlebell and the Rocketlok 20-36lb Kettlebell. The 14-20 lb is a great choice if you choose to focus on stamina and body toning, whereas the 20-36 lb will help build strength. Manufactures try to make their models as distinctive as possible by altering the shape, coating and color. Lookout for bells with a small base as these can tip over easily making some exercises difficult. When it comes to adjustable kettlebells, the standout difference is the way of holding weights within the kettlebell. 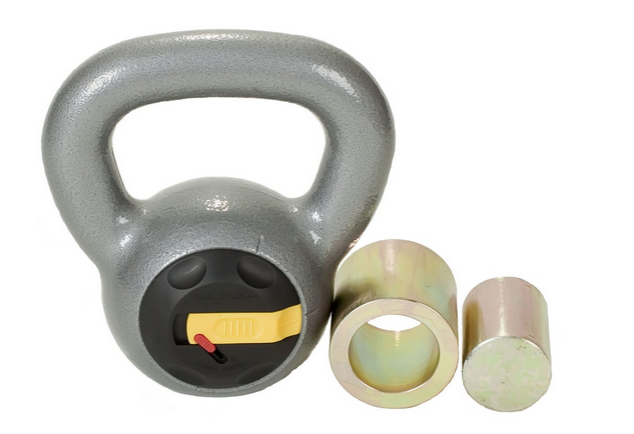 The Rocketlok Kettlebell uses cylindrical weights that fit in as shown in the image, while the Stamina Kettlebell uses weight plates that stack together. Of course it’s all down to personal preference, but having tested various models, the weighted plate design is my favourite. I found it less fiddly. Aside from being easy and safe to use, the weight locking mechanism is the one part of an adjustable kettlebell than can wear with time. For this reason, my advice is to lookout for a lifetime guarantee. Generally the simpler the method of adjusting weights the less than can go wrong over time. Lookout for a kettlebell with a minimal amount of components; locking screws in constant use are likely to wear out over time. The PowerBlock Kettle Block has no locking screws, weights are simply pulled out or pushed in. The most common method of adjusting weights is via a locking device on the top of the kettlebell. To adjust the weight setting, you rotate a lever to unlock the mechanism. Next, you add or remove weights before rotating the lever back to the locked position. Check out this how to adjust the kettlebell weight setting video. The color you choose is purely down to personal preference. The most important aspect of the color is the coating. The main job of the coating is to protect the kettlebell from chipping if accidentally dropped. An adjustable dumbbell is a one time purchase so it is nice to keep it looking in peak condition. Some dumbells come with a rubber bottom to protect from accidental drops. Top Tip: Lookout for a smooth coating otherwise it will affect the way the bell moves through your hands, resulting in blistering. A great looking kettlebell with a hard wearing coat is the CFF Russian Kettlebell. For a more traditional look, checkout the Stamina Adjustable Kettlebell. Kettlebell routines can be strenuous. This means it is important to find a kettlebell with a comfortable handle. A comfortable handle will also reduce injury risk. Here’s what you need to consider: The handle should be large enough to fit two hands snuggly. If you have particularly large or small hands, lookout for the right sized handle for you. For kettlebell traditionalists you may note that original kettlebells were not designed for two hands. Whilst this is true, most modern kettlebells come with handles large enough for two hands. Our tip is to look for a handle that will enable you to complete routines comfortably. The handle should also be smooth since most routines involve a swinging motion. A smooth handle will reduce the risk of blistering. Remember that the weight of the handle counts towards the overall weight of the kettlebell. Most adjustable kettlebell handles weight about 5 pounds. Steel or cast iron is the main material of a kettlebell. You can still buy a fixed weight kettlebell made from cement, but this is becoming less popular. All adjustable kettlebells have a locking device (usually made from metal) that works better with metal weight plates. The manufacturer of a kettlebell is another consideration when you are buying an adjustable weight. Most of the best makers of fitness products tend to provide high quality products compared to new comers in the industry. A strong market leader can also guarantee you a warranty of up to 5 years for the weight. This can build customer confidence when buying the weight since they not only get the value for their money but a long period of warranty. One of the benefits of an adjustable kettlebell is the price. Not only are they cheaper than fixed weight sets, models are available to suit budgets big and small. At the top end of the scale you can expect to pay $200. At the time of writing, the most common price range is between $50 and $150. For an up to date price guide jump over to Amazon. Lookout for kettlebells that come with offers such as Gold’s Gym Extreme Kettlebell. This model comes with a kettlebell workout DVD which is great for getting you started. Don’t let this be a deciding factor though. There are some great kettlebell for beginners videos on YouTube if you are looking for somewhere to start. When it comes to price, like anything stick to a budget and only pay what you are comfortable with. In my opinion, $200 is an excellent price for a top of the range model. The difference between high spec and low spec models is the quality of build and a lifetime guarantee. Adjustable kettlebells are suitable for both men and women alike. The kettlebell you choose will depend on your current strength levels and your fitness goal. Two popular models for women are the 3-In-1 Empower and the Rocketlok 14-20Ib. Both start at the lower end of the weigh range and end towards the middle. 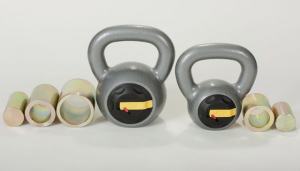 These kettlebells are great for improving fitness and toning muscles. Top Tip: Consider your fitness goals and current strength levels; lifting something too heavy will result in injury. If you are looking to build muscle, you should consider s different weight range. If you’ve enjoyed this adjustable kettlebell guide but still not sure an adjustable kettlebell is for you, Why not check my other guides? Looking for a standard kettlebell? Then checkout my best kettlebell guide or my competition kettlebell guide. If you’re still not convinced by kettlebells because you want to focus on muscle growth, I recommend checking out my best adjustable dumbbells guide. In a hurry? Use this adjustable kettlebell quick picks guide.